I absolutely LOVE salmon. If I didn’t stop myself, I would eat it every single night. My dad & brother made a few salmon-fishing trips to Alaska when I lived at home, so there was always a stockpile of wild salmon in the freezer. One of the best ways my mom prepared it was with lemon pepper. I still love that flavor, but I’ve realized how easy it is to achieve with simple spices & fresh lemon. No premade lemony flavored “stuff”, just real fresh flavors with that same great taste! Here it is two ways… both with the same simple ingredients. Let me know if you try, and which you like best! super moist, extra lemony flavor! Cut your lemon into 3/4" slices & place them on foil. Set the salmon on top, sprinkle with garlic powder, sea salt, & lots of pepper. Wrap up the salmon by folding in all four sides (like a burrito!). Bake for 20 minutes, unwrap, & serve! Lightly coat the bottom of a skillet with olive oil & bring up to medium-high heat. Season one side of your salmon with garlic powder, sea salt, & lots of pepper. Place the salmon seasoned-side down, and cook until golden brown (about 4 minutes). 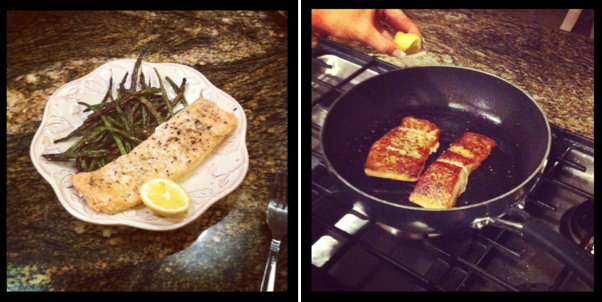 While the salmon is cooking, season the side that is facing up, so that both sides have flavor. 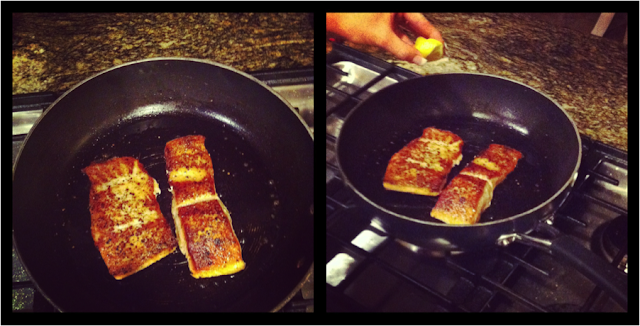 Flip the salmon with a spatula, and continue cooking until the salmon feels firm to the touch (about 3 more minutes). Squeeze fresh lemon on top & serve! That's it! Both ways are super simple, fresh, & flavorful. Make it a meal by pairing your salmon with my Crispy Oven Green Bean "Fries"! I'll have to try to the foil wrapped one in the oven - looks great! And, no pans to clean :) - the best part!